One of the best parts about receiving a monthly subscription box is the products I never would have tried and/or heard of without it. After Cuisine Cube…I needed a change. So, I opted to get a subscription to Conscious Box, which has become Bestowed. I love my little monthly treats and this one is affordable, and often has a blend of samples and full-size products. And I’ve already delved into it. This morning, I was prepping for a 6 mile run, and per the instructions of my sports nutritionist, I needed to get some fuel in my body before heading out. So, I went to the pantry and pulled down a package of one of the products I received a full-size sample of. It is like a granola (and we all know I love granola) and from a company called WholeMe. 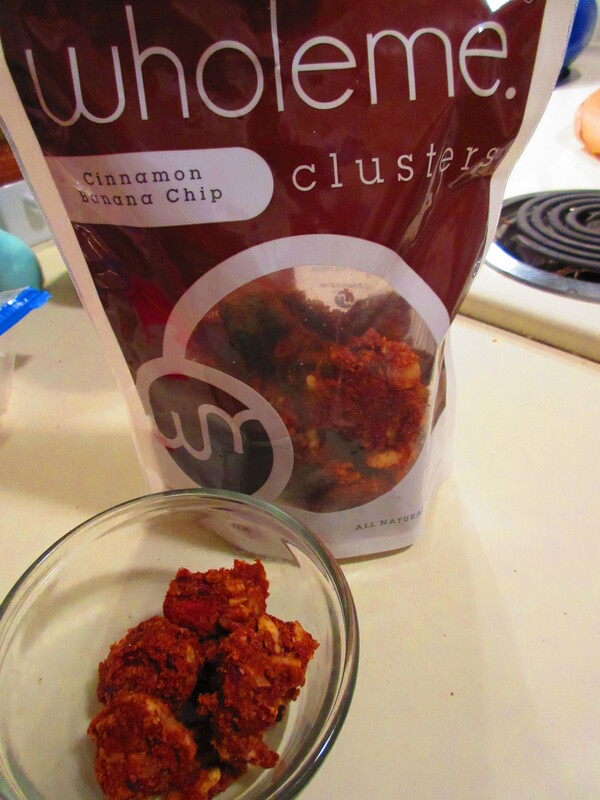 So, thanks to my Bestowed Box, I now was the owner of a package of one of WholeMe’s three variety of clusters. Their granola clusters are available in Almond Coconut, Lemon Berry Chia, and Cinnamon Banana Chip. As luck of the draw (or in this case…box) had it, I received the Cinnamon Banana Chip. And this morning…with 6 miles needed at 3:30 a.m…I needed to get some fuel before heading out. Without any extra sugars, I thought this might be a nice thing to munch on while I got dressed and ready to stretch and warm up. In fact, I went back for some more and then went and finished getting ready for my run. It’s sweet, without being overly sweet. It tastes mostly of banana. The cinnamon is nice for the flavor, but it doesn’t overwhelm the rest of the product. In a word…these clusters are freakin’ amazing. Out of this world. And GOOD FOR YOU!! They are soft and have great texture. Especially if you get a bit with a banana chip in it. Yummy! The bits of chocolate add just enough sweetness to keep the flavor interesting. And everything inside these clusters…is made from real food. Real food! I love eating real food. With a blend of nuts, seeds, natural sweeteners, and an appropriate hit of salt, cinnamon, and maca…this snack blend is a real treat…no guilt. So, if it’s so good for you, let’s take a look at these natural and real ingredients that go into a package of WholeMe Cinnamon Banana Chip Clusters, shall we? This granola mix is made from banana chips (bananas, coconut oil), honey, pecans, coconut, almonds, dried bananas, coconut oil, sunflower seeds, pure maple syrup, cocoa nibs, vanilla extract, cinnamon, salt, and maca. This blend is grain-free, gluten-free, naturally sweetened, paleo, nutrient-dense, preservative-free, soy-free, and non-GMO. It is all natural goodness, for sure! So, with that in mind, it’s time to take a look at the nutrition facts for the WholeMe Cinnamon Banana Chip Clusters. A serving size of the clusters is 1/3 cup (28 grams). There are 8 servings per package. A serving will serve you up 133 calories, 10 grams fat, 5 grams saturated fat, 0 grams trans fat, 1 gram polyunsaturated fat, 2 grams monounsaturated fat, 0 mg cholesterol, 67 mg sodium, 11 grams carbohydrates, 2 grams fiber, 8 grams sugars, and 2 grams protein. Not too bad for something that you can eat as cereal, by the handful, or as a topping to yogurt or ice cream. Seriously…options are endless. I haven’t seen this in stores anywhere in my area, and it looks like it is mostly available in Minnesota (where WholeMe is based out of). That being said, there is an online store…which I will definitely be hitting up in the near future. With real food that is really good…why wouldn’t I? This is right in my wheelhouse…and definitely gave me adequate and perfect fueling for my run. One of my favorite, favorite, favorite things to have to eat before heading out to my morning spin class (like 5:30 a.m. start time for class) is something as simple as yogurt, fruit, and a little granola. It isn’t too heavy to make me feel…BLEH (technical term, yes! )…while spinning out to awesome music and getting my sweat on, but it does give me enough fuel in the tank to not pass out or run out of gas during the workout itself. And…it’s refreshing…and delicious. So, when I randomly bought strawberries this past week at the grocery store (they looked good and I really wanted them), I randomly needed to get granola to go with it. I have an abundance of yogurts (vegan and otherwise) in my fridge for my roomie and I at all times. But granola…not so much anymore. I’ve just been trying other breakfast stuff…like Gluten Free NY-Style Bagels and all that. That being said, this was necessary this week, for sure. And while out and about on Saturday doing our very random grocery shopping at at least 5 different stores (NO JOKE! ), I was on the hunt for a granola that wasn’t too high in sugars and that would pair nicely with strawberries. I opted for one brand, and then quickly changed my mind when I spotted the Van’s Foods granola in the gluten-free section of said store. I’ve only had one other version of the Van’s Gluten Free Granola Clusters, but what I loved about it was the soft and chewy nature of it. So, back went the original brand I had scooped up…hello to one of the newest additions to the Van’s Gluten Free Granola Clusters lineup. The flavor…Banana Nut. I am a runner…a marathon runner. This means I have this special place in my heart for banana. Banana bread (gluten-free of course), banana cookies, bananas with peanut butter, banana chips…and yes…straight up banana. Banana is my pre-long run eats. So, anything banana makes me one happy girl. No question about it…I wanted to try this granola. And I have been totally devouring it and enjoying it all weekend. Like the other granola clusters that they sell, Van’s Gluten Free Banana Nut Granola Clusters are…really more one large mass of granola, rather than individual clusters. But that’s fine. The massive chunk of granola does break apart easily, making for easy sprinkling over yogurt or whatever. It also makes for good pinching material for stealing snacks between meals, before eating, or just…because. I love the soft and chewy texture of this granola, because while I do love granola with a crunch, this texture just pairs well with…everything. And I can eat it quietly and not feel like I might wake up my roommate simply by chewing. What I do love about this granola is how the banana flavoring doesn’t overwhelm or overpower the actual granola itself. This makes it perfect for pairing with anything…oatmeal, yogurt, fruit, smoothies, ice cream, etc. Oh yeah…it’s amazing. There are bits of nuts included in the clusters as well. It’s a delicious way to start your day…or end your day…or to have throughout the day. And I don’t feel bad about snacking on this…because Van’s takes pride in the ingredients they use and the nutritional worth of their products. It’s a win either way. Definitely a win when banana is involved. So, let’s take a look at the ingredients that are used in put together the Van’s Gluten Free Banana Nut Granola Clusters, shall we? As I stated, Van’s uses ingredients that they are proud of. For this variety of their Granola Clusters, Van’s includes gluten free whole oats, brown rice syrup, invert cane syrup, cane sugar, non-GMO expeller pressed canola oil, unsweetened coconut, pecans, honey, flax seed, gluten free oat bran, almonds, natural flavors, salt, walnuts, vitamin E tocopherols (for freshness). Gluten-free, vegan, and made with whole grains. Gotta love that. Now let’s look at the nutritional information of the Van’s Gluten Free Banana Nut Granola Clusters. A serving of this granola is 1/3 cup (30 grams). This serving will provide you with 120 calories, 5 grams fat, 1 gram saturated fat, 0 grams trans fat, 1 gram polyunsaturated fat, 1.5 grams monounsaturated fat, 0 mg cholesterol, 25 mg sodium, 19 grams carbohydrates, 2 grams fiber, 6 grams sugars, and 2 grams protein. Deliciously well-rounded, balanced, and not too bad on the nutrition. I like that this brand keeps added sugar levels low. Some granola has double digit sugars in a serving. Van’s Gluten Free products have always impressed me and been amazing. I love the soft and chewy texture of their granola clusters. 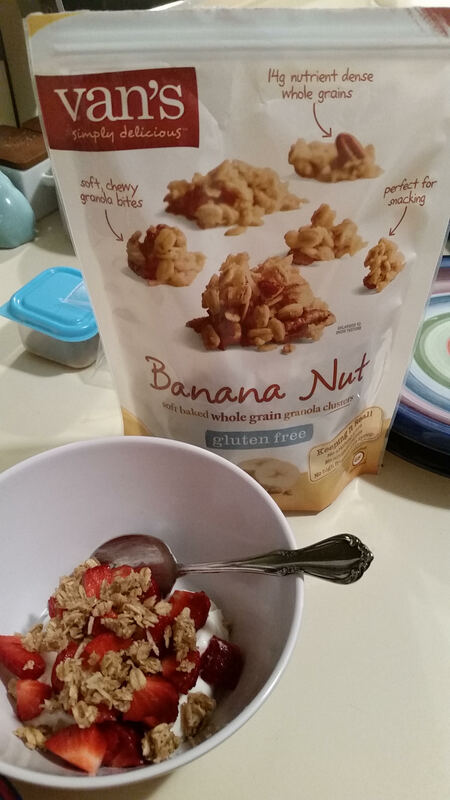 And the Van’s Gluten Free Banana Nut Clusters is definitely a new favorite. This package is almost empty…so I think another trek out to purchase more is a must. If you haven’t tried Van’s Gluten Free Granola Clusters…make a point to do so. It will change your granola-loving mind forever!! It was at the Gluten-Free Food Allergy Fest in Indianapolis, Indiana this past October that I was introduced to one of Freedom Foods newest products. Now, I’m already a huge supporter of the amazing, healthy, gluten-free products from Freedom Foods, but what I didn’t know up until that point was that they have moved beyond just cereals and (the best thing ever) Smudge (a dairy-free and nut-free version of Nutella). I made a purchase of the Freedom Foods Fruity Rainbow Rocks at the expo, and for my purchase (of umpteen million boxes), they threw in a free box of one of their new (at the time) products…their Freedom Foods Chewy Oats, Apple & Cinnamon Granola Bar. NICE!! As I have been a huge fan of everything I have tried from Freedom Foods, this was a nice treat and a huge added bonus for me. I’m really cautious when it comes to buying protein bars and granola bars, as so often they are just laden with processed sugars, preservatives, chemicals and all that stuff that does the body no good. But not so when it comes to Freedom Foods. Their food should always find a spot in your pantry, bag, shopping cart…because their products are all free from gluten, low in salt, a great source of fiber, are non-GMO project verified, have NFCA Certification, are vegan, are kosher, and contain no artificial colors, flavors or preservatives. Basically…what you see is what you get. And I absolutely LOVE that. In fact, Freedom Foods offers a variety of products, although only a few items are available in the United States at the moment…and most of these include cereals, which, for the record, are made in a dedicated and specially built allergen-free facility in the Riverina region of New South Wales, in Australia. As Freedom Foods was specifically developed to make allergen-free foods, they test every batch made in their facilities, to the most stringent levels possible, leaving no doubt that the Freedom Foods products you pick up will be free of the allergens that are necessary to avoid. Because we live in a world where it’s not enough to just be health conscious. Now we have to be allergen conscious too. With the growing number of food allergies and intolerances, it is nice to find a company that really proves that it is dedicated to creating products that are safe to consume. Freedom Foods has been around for over 20 years, making great-tasting and nutritious allergen-free food. I can attest to this, as I am a huge fan of the products I have had from them thus far. All of their products adhere to the strict guidelines laid out by Australia’s food industry, meaning all their products are non-GMO. They even test for GMOs just to make sure. 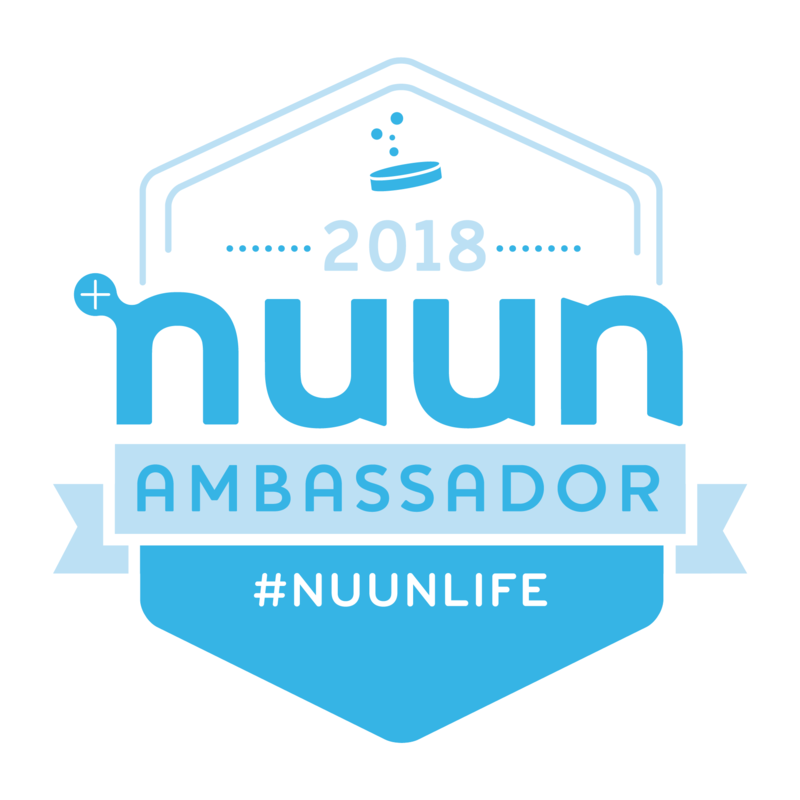 So, here I am…4 months after the GFFAF and just now tearing into the box of free goodies from a company that I adore and trust. What is wrong with me? Well, just been working my way through the pantry and trying to do so systematically. But this was to be paired with my container of Chocolate Chia Superfood Pudding after my gym sessions this week. And, I admit, I was a small bit concerned that I wouldn’t like it, even packing a backup bar…just in case. Back up bar wasn’t necessary though. The Freedom Foods Chewy Oats, Apple & Cinnamon Granola Bar was…simply put…fantastic. It’s the perfect snack as it’s small and easy to pack into a purse or pocket…ideal for an on-the-go breakfast or when that snack attack happens mid-afternoon, yes? Hey…it happens. Pretty much every day for me. And having something healthy to reach for, rather than candy or sweets, is good for me. Because, we all know I have quite the sweet tooth. Well, not only does the Freedom Foods Chewy Oats, Apple & Cinnamon Granola Bars fulfill any sweet craving, I don’t feel guilty noshing on it either. Not only are they low in salt, with no added artificial colors or flavors, but they are also free of gluten, wheat, almonds, hazelnut, walnuts, dairy, soy, and eggs…and instead contain a whole heap of wholegrain oats, tasty apples, raisins, and sweet cinnamon. They prove to be a great source of filling fiber. And…guess what? They taste amazing. No backup bar required. I loved these bars at first bite. They are sweet, without being sugary. They are crumbly and chewy, and not dry. They are packed with fruit flavors and have amazing texture with the coconut, oats, apples and raisins. Seriously…love. LOVE. And, like I said, I can be pretty picky about my bars. But these are a dream. A serious granola bar lovers dream. I devoured them the past two gym days if that tells you anything. So, now that I’ve raved over the Chewy Oats, Apple & Cinnamon Granola Bars from Freedom Foods, let’s talk about their ingredients! These bars are made from whole grain rolled oats, glucose syrup, rice cereal (rice flour, yellow corn flower, psyllium husk, whole grain sorghum flour, sugar, canola oil, salt, sunflower lecithin, sultana raisins, glycerin, erythritol, dried apple (contains sulfites), canola oil, resistant dextrin inverted sugar, coconut (contains sulfites), maltodextrin, natural flavor, sunflower lecithin, and sodium bicarbonate. And as far as that coveted nutritional information goes…Freedom Foods Chewy Oats, Apple & Cinnamon Granola Bars have amazing stats. Seriously. A serving size is one (1) bar, and there are 6 bars in each box. This one bar will provide you and your body with 130 calories, 3 grams fat, 0.5 grams saturated fat, 0 grams trans fat, 0 mg cholesterol, 10 mg sodium, 21 grams carbohydrates, 3 grams fiber, 6 grams sugars, and 2 grams of protein. Filling…but filled with good stuff, that’s for sure. I love how Freedom Foods continues to hold itself to the highest of standards when it comes to their products. Their focus on a better and healthier diet, through the food they produce, is evident in the products that they put out on the shelves. I have yet to be let down. Totally amazing. Totally delicious. And yes…filling. One of my favorite things to purchase at the grocery store on occasion is…granola. Especially granola that isn’t loaded down with sugar. Granola is so versatile. You can eat it on its own, put it atop yogurt, or ice cream, or oatmeal. It’s the perfect thing just to have on hand in the pantry. And for a little while…I was without. 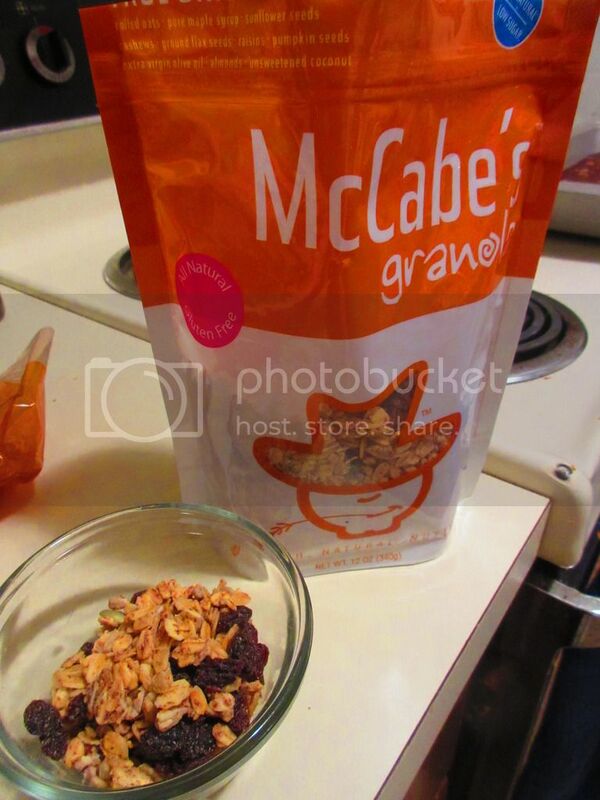 But then my local Kroger ran a Manager’s Special on some items and one of them was McCabe’s Original Granola. With $3 off the regular price, I couldn’t pass up the chance to try this granola I had been eyeing on the shelves. I admit to being a bit of a granola snob. Most gluten free granola is laden with excessive sugars and are far from healthy. But McCabe’s caught my eye because all ingredients are recognizable (no chemicals), and it was low in sugars and carbohydrates. It took me a major sale to actually buy it though because I never could fit it into my budget. But…now I think it’s worked its way into one of my favorite brands. And this is simply based off the True Original variety. Because, you gotta start with the basic. McCabe’s Granola is a family owned business, run by Susan (mom), Chris (dad) and their sons Jameson and Michael. Their goal is to provide you with the healthiest, most flavorful granola and granola bars possible. They take great pride in their products and their family, and the products they produce definitely reflect this. I purchased the McCabe’s True Original Granola. Basic. Simple. But basic and simple doesn’t mean boring. Especially in the McCabe’s True Original Granola. I have eaten this over fruit, over yogurt, by the handful…and I never get tired or bored with it. For a granola that isn’t just a bunch of sugar…the flavor is awesome. This granola is proof that original isn’t simply plain. Becasue there is nothing plain or tasteless or boring about this granola. The bag refers to it as “The freshest, most natural, nuttiest granola in town,” and it’s not that far off. It’s low in sugar, it’s made with natural (non-GMO) ingredients, it’s gluten free. It’s awesome. The blend of oats, seeds, raisins, and coconut bring great variety for texture and taste. I love every handful (oh yes…I can (and do) eat this by the handful) of this granola. My pouch is almost empty, but now I’m willing to pay the full price. I know whatever flavor I end up purchasing, it’s going to be good. As far as nutritional information goes, McCabe’s True Original Granola is awesome when compared to other gluten-free granola is outstanding. A serving size is 1/4 cup (28 grams) and there are about 12 servings per container. One serving will dish up 130 calories, 8 grams fat, 1.5 grams saturated fats, 0 grans trans fat, 0 mg cholesterol, 0 mg sodium, 13 grams carbohydrates, 2 grams fiber, 4 grams sugars, and 4 grams protein. Lower in calories, sugars and carbohydrates when compared to other brands of gluten-free granola, McCabe’s really shines as a healthy granola choice. I can eat granola for breakfast or a snack, and I don’t feel at all guilty when I reach for this package. McCabe’s is certainly fulfilling their statement to provide a healthy and flavorful product. I am beyond impressed. McCabe’s Granola is available in the following flavors: True Original, Delta Blueberry, Cran With A Twist, and PB & Chocolate. If you want a great choice for granola…this is definitely one that you should consider purchasing. For real. So go. Find it. Buy it. And devour it. One of the best things to ever come from my birthday expedition to Jungle Jim’s International Market (FOODIE HEAVEN!) was discovery local (to Ohio…not to me) bakeries through the products they had on display and for sale at Jungle Jim’s. I love purchasing these items over everything else, because, well…I LOVE supporting local businesses. So, one of the products I snagged from the end cap of gluten-free local bakery goodies at the market was this amazing sounding granola from a place called Tina’s Sweet Treats, based out of Franklin, Ohio. Tina’s Sweet Treats came about after six (6) members of her family were diagnosed with Celiac. She went from casually baking gluten-free to full-blown. And, as with most people, wanting to make sure that her fmaily didn’t miss out on any of the wonderful baked goods that they loved, Tina worked hard to create products that won’t lack in flavor, taste, or make her family members feel like they were missing out on something amazing. Everything from Tina’s Sweet Treats is baked fresh from their home kitchen, which is completely free of contamination! I love it when I can also get a product and feel 100% secure that it won’t make me sick. When something is produced where contamination will not even come into question, I never have to play roulette with my body. And for that, I am thankful! Jungle Jim’s had a few options from Tina’s Sweet Treats…but the one that really caught my eye…mostly because I don’t see a lot of this from local bakeries…was the granola. But not just any granola. Probably what may be considered the most epic of all granola. You had my full attention with all three of those words. Into the basket…into the shopping bag…into the car…into my pantry. And it didn’t last long. This past weekend, I was baking and cooking up a storm, and my lunch was something quick and easy on Saturday. I had a soccer match to get to and I needed to make some Gluten Free and Vegan Snickerdoodle Blondies and some Dairy Free Pumpkin Ice Cream before heading out to the big playoff match for Louisville City FC. Thus…lunch became a yogurt with granola on top. I remembered I had the granola…and being that it is made by a bakery, no preservatives are added and therefore, it is best when used by the sell-by date. This would certainly accomplish that. So, after palming a handful to taste on its own (OH MY GOD YUM! ), I poured some on a yogurt for my roommate and some on mine. It was a simple, yet delicious addition to already delicious yogurts, let me tell you. What I love, first and foremost, is that toasty flavor you get with homemade granola. Top it off with that aroma and the taste of fresh banana bread, and you’re talking about a winning combination. And that is exactly what Tina’s Sweet Treats accomplishes with this gluten free Banana Bread Granola. It was the perfect topper and stir-in for my vegan yogurt, and acted as a bit of a “sundae” topper for Cathy’s Banana Greek Yogurt with a Chocolate Topping. It was, without a doubt, a way to kick up the yogurt lunch a notch. And, the added crunch was that bonus that sometimes yogurt lacks. I wish I lived closer to Tina’s Sweet Treats. I’d purchase this every week. Probably multiple times. The Tina’s Sweet Treats Banana Bread Granola is made from rice flour, potato starch, millet flour, tapioca flour, sweet rice flour, sugar, apples, milk, butter (cream, natural flavorings), eggs, brown sugar (white sugar, molasses) sour cream, baking powder (corn starch, sodium bicarbonate, sodium aluminum sulfate, monocalcium phosphate), vanilla (water, alcohol, vanilla bean), xanthan gum, baking soda (sodium bicarbonate), and salt. Since this is made out of a home and sold by a local bakery, I don’t have any of the nutritional information. But…as with all granola out there, stick to a serving (usually around 28 grams), and don’t go overboard. It’s all good. Enjoy a sweet treat (see what I did there?) every now and again. Love at first banana bread-y bite. 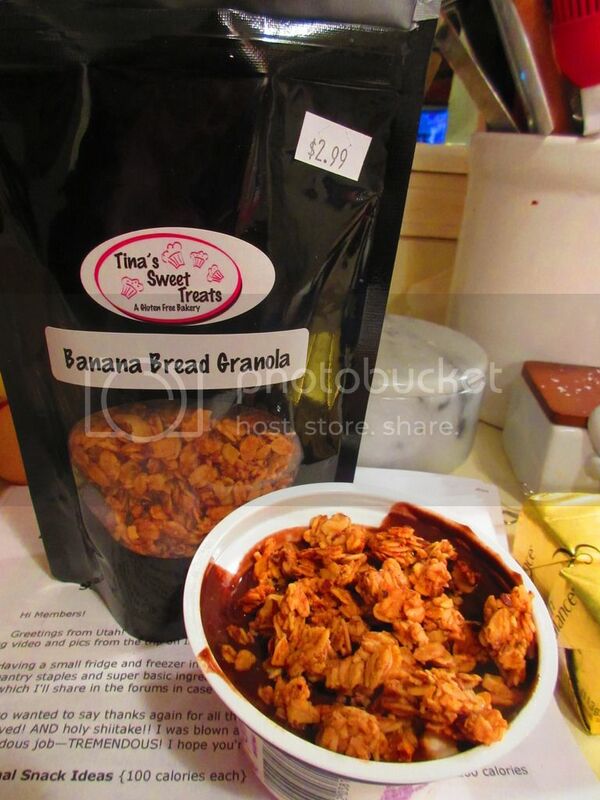 Seriously, if you are a lover of banana and banana bread, Tina’s Sweet Treats has you covered with this granola. I only wish they had it online to order. Just…pure goodness and pure wow any way you want to eat it. Personally, by the handful is the way I recommend. HA!